Once I had my test hook fitted, I realized I could use it as a template for cutting out the real hook. I just laid the Douglas Fir template on top of my glued-up oak blank, drew the outline and cut it out. Then I used the template to eye-ball the angles for the bevels. In a few minutes, I had a copy of my test hook. Then it was time to cut the camber in the top of the hook. 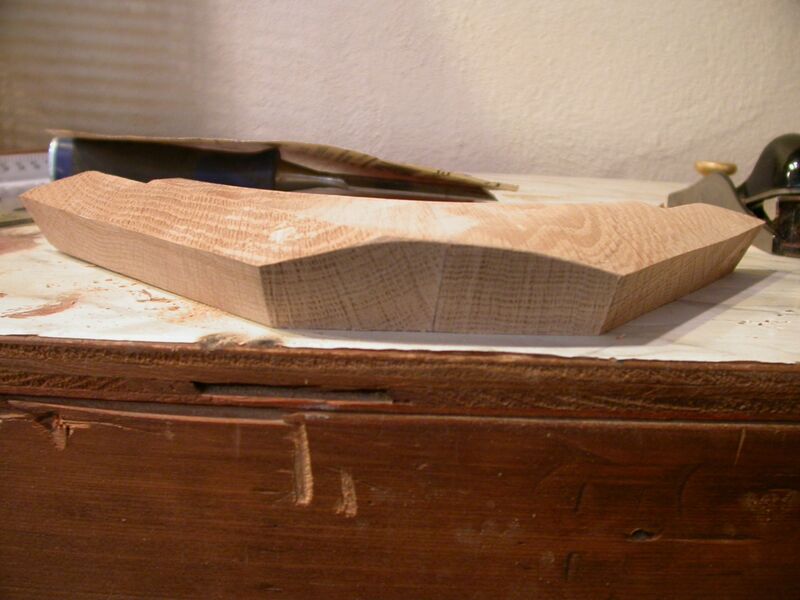 I'd been thinking about how to cut this gentle curve into rock-hard oak. You can see from the picture below that there was quite a bit of wood to cut away. 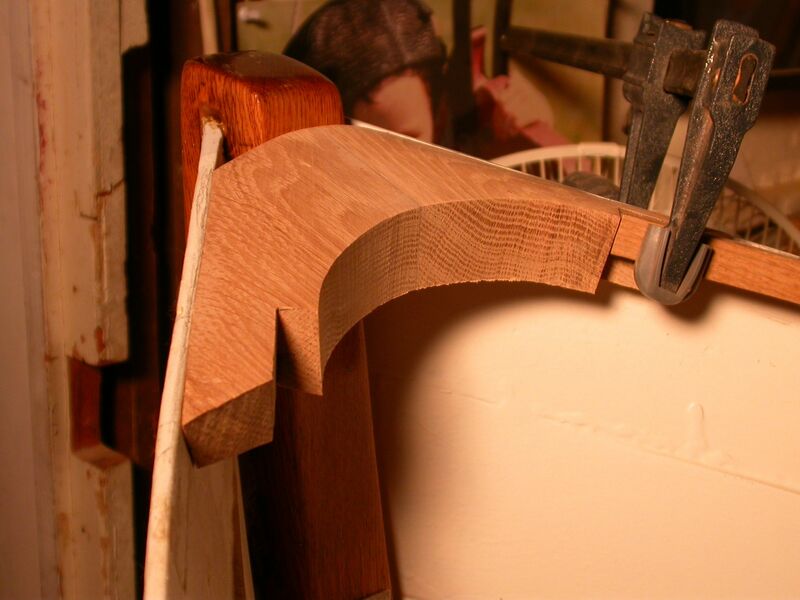 A friend recommended a drawknife or a spokeshave, but I thought that would be a lot of work, and I didn't think my drawknife skills were up to producing a symmetrical, smooth curve. In the end, I decided to use the trick used to create round spars. 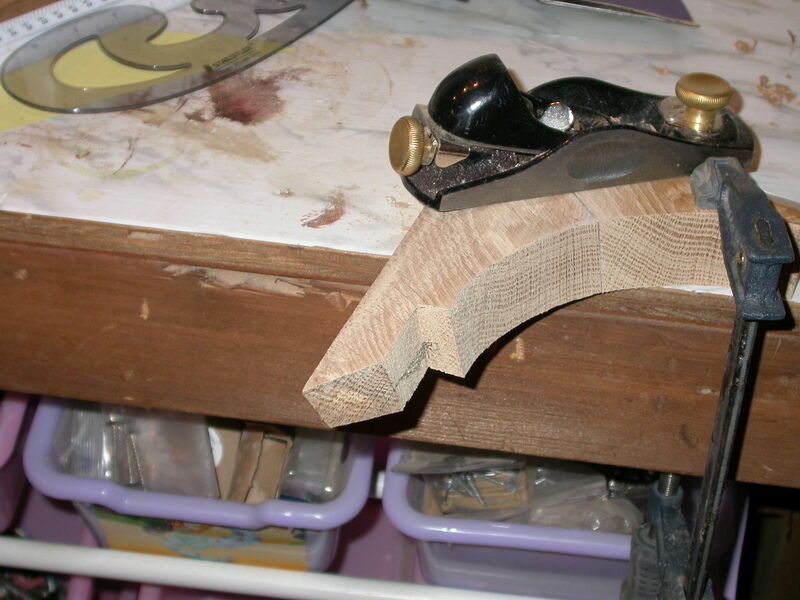 I'd make a flat cut to remove most of the wood, then shape the two flat sides into a curve with a block plane. The picture below shows the flat cut. I made this by hand on my bandsaw. I just held the piece at the right angle and pushed it through the saw. A little rough-and-ready, but it worked quite well. After cutting out the notches for the inwales, I cut out the curve. This looks straight, but it's actually beveled at the same angle as the notches. This makes sense if you think about it, because the inwale is rectangular in shape. 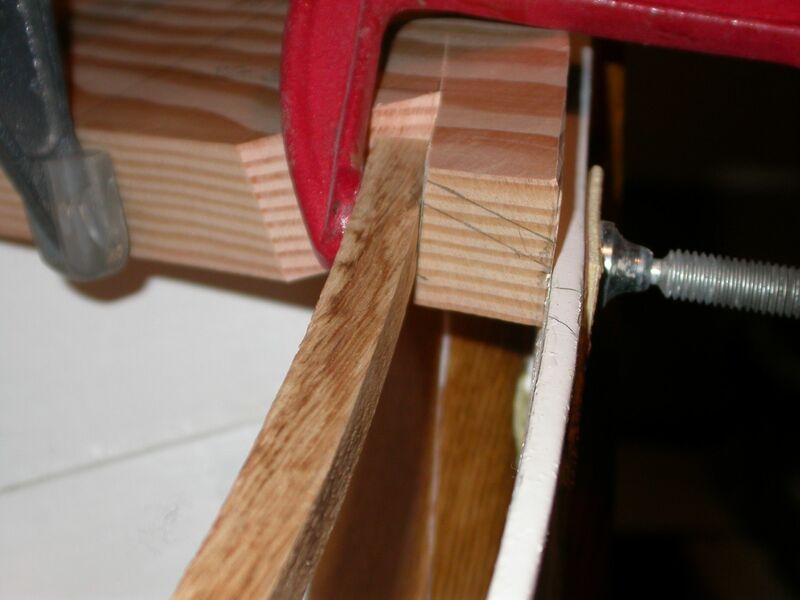 The inwales lies against the notch, so if the curve is to blend smoothly with the side of the inwale, it must be at the same angle as the notch. QED! I realized this while cutting the notches, so as long as I had the bandsaw at the right angle, I cut the curve at the same time. 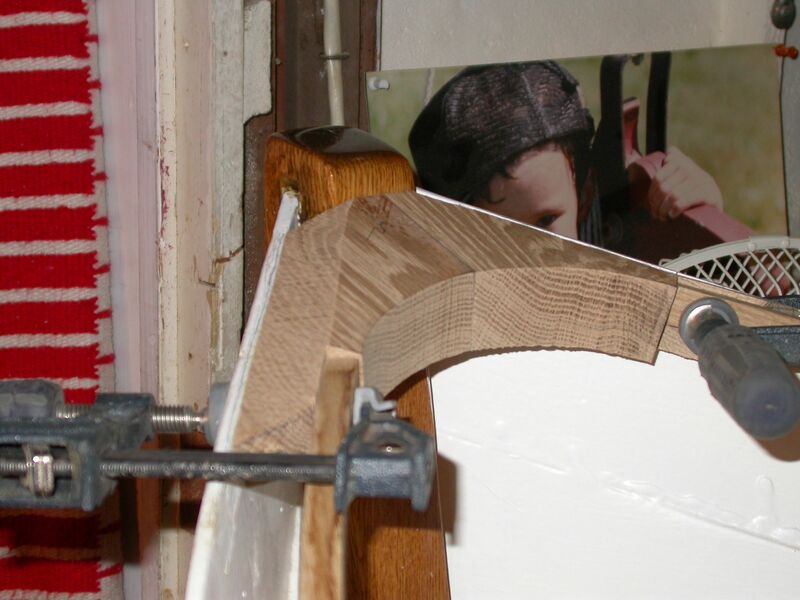 In the photo above, you can see there is still plenty of wood to shape into the curve. I penciled in the upper and lower edges of of the inwale, and then moved the piece to the bench. 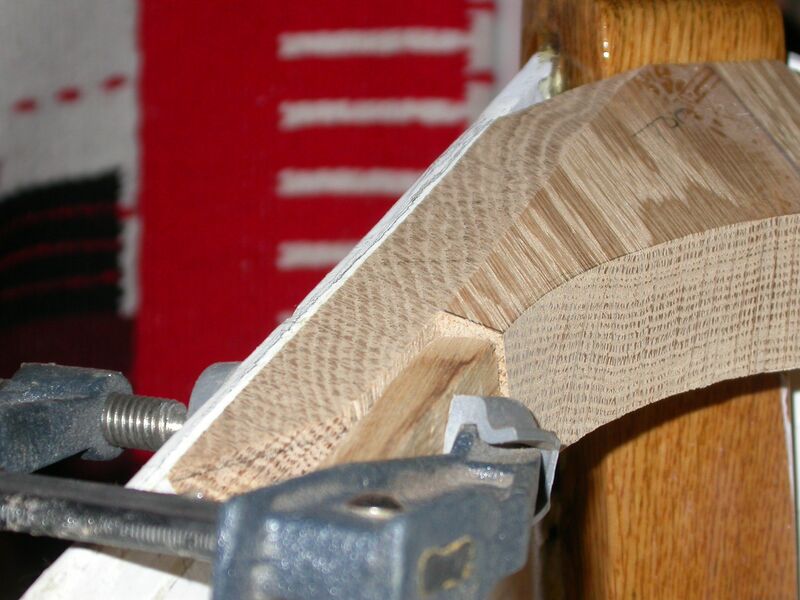 I used a block plane to remove the rest of the wood, and to shape the curve down to the lines. The picture below shows the job half done. The port side is curved, the starboard side is still flat. 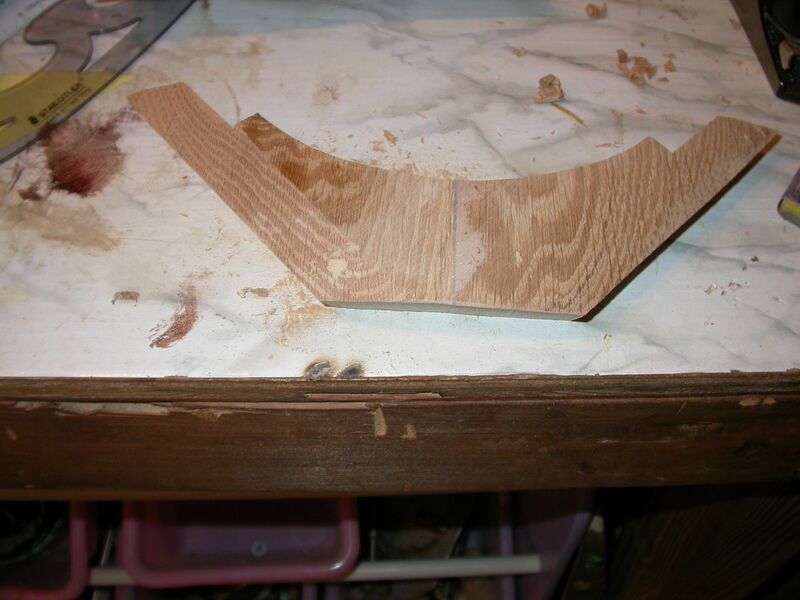 With a sharp block plane, it only took a few minutes to shape the curve. It was much easier than I expected, actually. Another view of the same stage, with flat cut on left and round camber on right. When both sides were shaped, I tried it on for size. A pretty good fit, and a very pleasing shape, if I do say so myself. All in all, this step was worse in the anticipation than the execution. I was 100% sure I'd ruin this piece cutting the camber, but I was pleasantly surprised at how easy it was, once I came up with a plan. The main difficulty with these breasthooks is all the bevels and curves. I had a hard time visualizing all of them, no less figuring out how to cut them. But just required a bit of thought and time. This is one of those jobs that you don't know how to do, until you are done. That seems like an unbreakable paradox, like time travel, but some how you need to break it. I can think of no good reason not to keep the bottom flat? I don't see the point in cutting the negative camber you can make an argument for the asthetics of the thing I suppose. If I were to do it I would bevel the outer edge to assimilate the camber rather than trying to did out the entire piece. You can simply marke the mirror edge and grind out the waste sand and smooth. The bottom camber is purely for looks. If strength was the only issue, these breasthooks would be a lot easier to build. The tricky bit is making them look good. They say you can judge the boat builder by looking at how these final pieces fit together, and I believe it. It is by far the hardest part of the build. Ironic that the first step (lofting) and the last step (gunnel system) are the hardest. At least for me. I agree with Knotabus. keeping wood for strength is always a good thing IF weight isnt an issue. Maybe a scrub plan to remove most of the waste, then a chair scorp?